Recently, whilst rearranging the shelves of archive videos I came across something I’d forgotten about. In 2002, Imperial had honoured Senior Minister of Singapore Lee Kuan Yew (in recognition of his promotion of international trade and industry, and development of science and engineering study initiatives with the UK) by appointing him a Fellow of the College at the Commemoration Day held at the Royal Albert Hall. 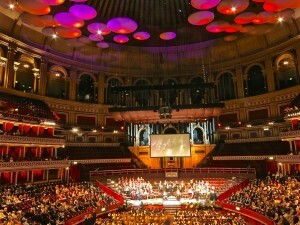 Because this was a significant event, college had hired a company that occasionally provided a large video screen and cameras to help people see events in the Royal Albert Hall. We attended the event to get some background video shots and to also see what effect this new idea had on the ceremony. 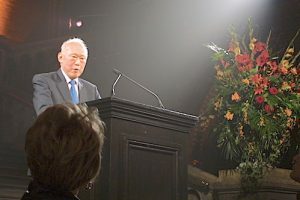 The previous night we had attended the first ever Commemoration Eve Dinner held at the Natural History Museum, where he gave the keynote address (seen left), we recorded and used that in full. College did not need his Commemoration Day speech recorded because we had the one from the previous day. However, as this was the first time that cameras had been covering a Commemoration Day, I felt that this was unique enough to ask the company to make video recordings (right) of both morning and afternoon sessions. College had already indicated that they had no use for any of the footage, but, by being a ‘first’ I disagreed. So, both morning and afternoon events were recorded and promptly put into our archive collection and there they have sat for all of these 16 years. Let’s see the first ever fully recorded Commemoration Day sessions from 23 October 2002 which are now available on line for the first time. For those former students who were at the 31 May 2006 Postgraduate Awards Ceremony 10 years ago, here for the first time is the video of that event. Until now this was only on a purchased DVD, but the entire ceremony is now available to view in full on our YouTube archive channel. 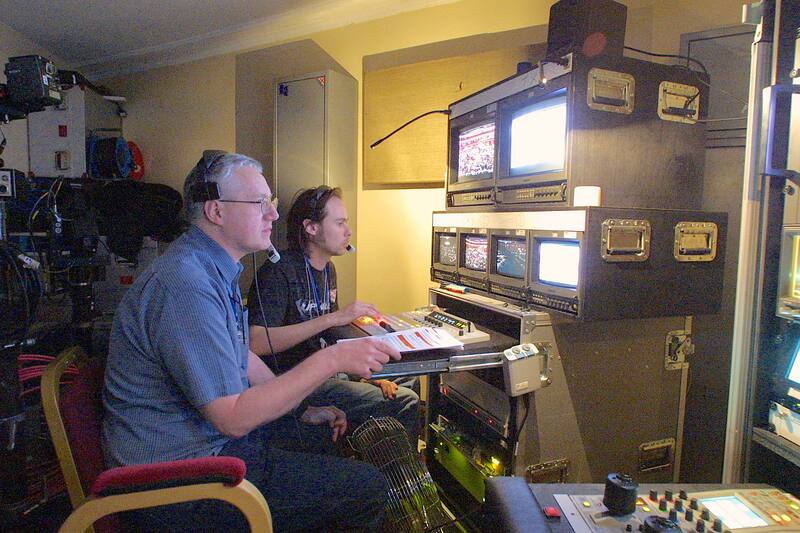 The picture shows me and Martin Sayers behind the scenes producing the video of the ceremony. Not only is it recorded, but it’s also relayed onto the big screen up above the Royal Albert Hall stage. Although I’ve retired, I was once again back at the Albert Hall last October to help Martin behind the scenes to record Commemoration Day 2016. 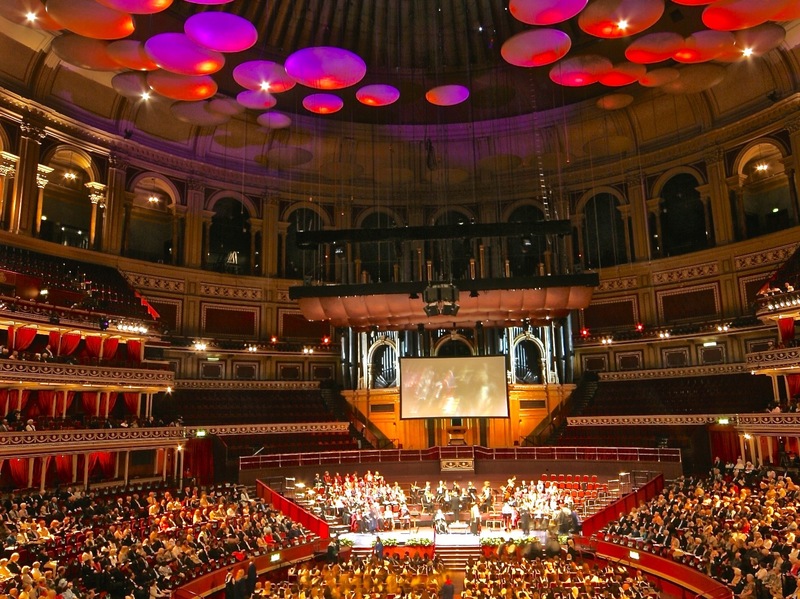 The May 2003 Postgraduate Awards Graduation Ceremony was the first time that we had taken cameras into the Royal Albert Hall for this particular event. The previous October 2002, we had relayed the scenes from the stage onto a large projection screen. This was for the special Commemoration Day visit by Lee Kuan Yew. However, I asked the company providing the cameras if they would record the event anyway, even though we didn’t have a use for it at that time (other than archival). Those videotapes are still in our archive and I will, at some point, run them off into digital form for the benefit of those who graduated that day. 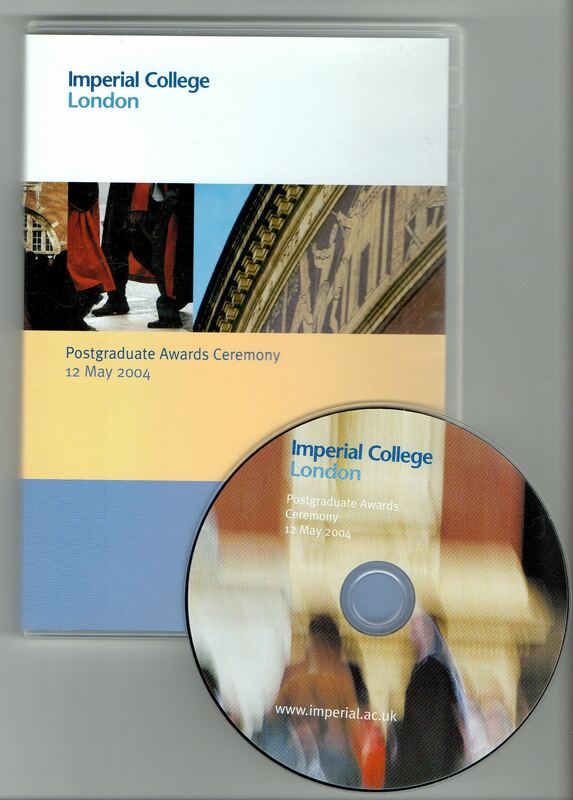 The following May 2003 we were asked to once more make arrangements to provide cameras and a large screen for the Postgraduate Awards Ceremony. Again, I asked that we record the whole event to ascertain the feasibility of recording and then distributing the event coverage on DVD, we also did the same in October for Commemoration Day. What you will see below is that 2003 recording, which has been digitised for the first time, from the only recording made, which was on a DVD-RW disc. In 2004 we recorded the PG Awards ceremony once more, but with the specific intention of creating and making available DVD’s. The disc produced and its art work was created totally in-house, other than the actual disc pressing which was not possible for us to do. That first disc created can be seen on the left hand side. 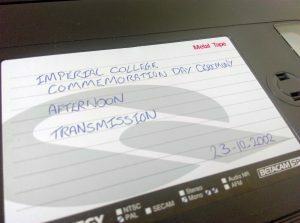 This process carried on for many years (along with Commemoration Day each October) until the ceremony coverage was eventually made available only on the Imperial YouTube channel, rather than on DVD’s.